My son needed a shield to go with his Captain America teeshirt to turn a teeshirt and a pair of jeans into a very casual costume. We planned on getting him one from Hot Topic but they were sold out. So his sister and I talked and decided we could do something with duct tape. We got rolls of duct tape and went through the boxes we've saved for such things to find ones big enough that we could make it. It turned out the largest base we could make using one box was about 27 inches in diameter using two half circles taped together. We talked and decided that doing duct tape appliques was probably beyond both our skills. But we are both fair hands with covering things in duct tape, so we planned it out that way. 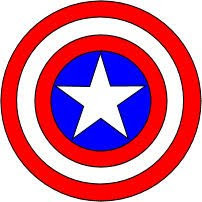 This is what the shield is supposed to look like. So after consideration, we decided the easiest way was in 4 shapes. 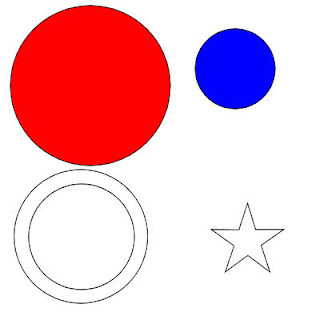 The large round red base, a ring in white, a round piece covered with blue and the star. So we started cutting up and assembling boxes into the necessary pieces. The ring because of box size limitations had to be done in 4 sections, so we used a pencil and a piece of yarn to mark the initial quarter ring and then used that very carefully to make the other 3. Butted the ends and taped it together. The first part we covered the back first using a roll of black duct tape we had and going across the length, turning, and going across until we had the whole thing covered. 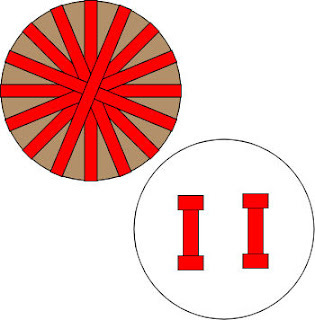 Then we flipped it over and did the red the same way turning the ends of the tape over to the back side of the shield. Then we taped up the ring using short strips and wrapping them around one at a time until the whole thing was covered. We covered the blue circle the same way we did the big red circle. Then taped up the star. After we got all the pieces covered, we used double sided duct tape to put everything together, but foam tape would have worked as well. We burnished it down tightly. The straps are strips of doubled duct tape taped securely in place. The basic technique will work for any shield I think. 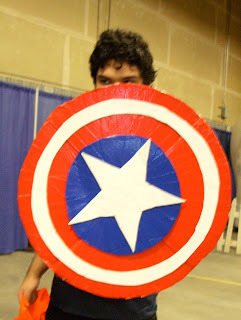 You could also do cresty type cut outs or hot glue designs then cover the shield with used aluminum foil and burnish it down to make a fancy decorated metal shield. William was very happy with his shield. I know my son, 18 or not, he will hang it in his room and display it with pride for years. My dad was absolutely impressed with it.